Jensen Tools L4458JTR1 Pallet, Empty F/ JTK-48. 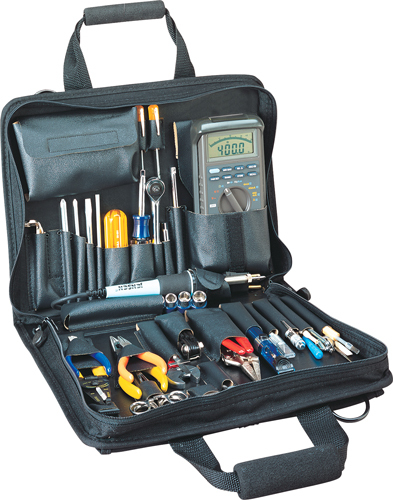 17.75 x 12.75"
A great selection of tools in a zipper case. A complete 13-piece 1/4" drive socket set including ratchet, spinner handle and extensions, 9-blade foldup hex key set, 11-blade feeler gauge, plus locking pliers. Also included are a set of four miniature Phillips metric screwdrivers, DIP remover, hemostat, trimpot adjusting tool, solder remover and other solder equipment, pliers and cutters, assorted screwdrivers, wire stripper, and more (see complete listing below). The Cordura Plus case features three outside pockets for documents and test equipment, two outside pockets are 6 x 10 x 2", and one is 12 x 10 x 2". Lot of inside pockets for cell phone, test leads and more. Padded web strap handles and D-rings attached for optional shoulder strap. Note: Meter is not included with the tool kit. JTM-69A meter may be ordered seperately. Please check bellow for complete list of items. Hex key set, fold up (9) .050-3/16"
Pliers (5): diagonal cutter, 4-1/4"; long nose, 4-3/4"; long nose with cutter,6-3/4"; retaining ring,convertible locking, 6" Rule, stainless, 6"
Screwdriver, Phillips #0 x 3"
Screwdriver, slotted, 3/32 x 3"Screwdriver blades (4): Phillips #1, #2; slotted, 3/16, 1/4"
Click the button below to add the Jensen Tools JTK-86BK Technician's Tool Kit in Single Black Cordura Plus Case to your wish list.